Imagine surfing the Web, and being able to look at what other Web sites or other visitors wrote about the site you’re visiting. For example, someone might be viewing a manufacturer’s web page relating to a product they are interested in purchasing. A past effort at Web annotation was the Third Voice browser plug-in, which let people post public notes about a site that could be seen by other Third voice viewers. Many of those ended up being spammy and/or inappropriate. Click on the image below for a larger version of Google’s potential approach. This invention would let people receive summaries of blog posts linking to the Web site being visited. Those people could also perform a Web search or blog search through a search engine requesting documents relevant to the site. Annotations relating to web sites may be based on blog posts relating to the web sites. A user viewing a web site may concurrently view related blog posts about the web site. More particularly, in one implementation, a method includes detecting when a user visits a web page and receiving, in response to the detection, a group of blog posts that link to the web page. The method further includes displaying an indication of the group of blog posts to the user while the user is visiting the web site. inappropriate or spammy comments about a web site can be reduced, as blog posts tend to have an inherent level of seriousness associated with them and the blog posts can be ranked or otherwise filtered based on the quality of the underlying blog. A status bar may indicate how highly a site or page is annotated, with a “buzz” icon shown, tied to a “buzz rating” based upon the annotations linking to the site. It may reflect the “number, quality, and/or temporal relevance of the annotations.” The icon may change in size and/or color to provide an indication that the annotations for the site may have changed since a last visit. The most interesting element to me is the inclusion of sites linking to the target resource. Given that Google bastardised the public link: operator many moons ago, I wonder how they would handle the implication of giving out linking data publicly which previously they chose to suppress? Implementing this would be interesting in that it might provide some insight into links to pages that the Google “link” search operator might not be showing. I would use a tool like this if it were offered. From a research perspective, this really could be a great tool. I’d hope that they would offer the option of searching by “relevance” and by most recent, like Google’s Blog search presently does. I could see reading an article that I thought was interesting, and wanting to see if anyone else had written about it, and being able to check very easily. I think the “blog posts can be ranked or otherwise filtered based on the quality of the underlying blog” will be pretty key to making this a useful product rather than a way to highlight the umpteen bazillion blogs out there. That said, I think this could be pretty useful, especially for researching very specific or niche topics. The annotation space is picking up steam again – protonotes.com, fleck.com, trailfire.fire, diigo.com, etc. Interesting, don’t really know if I like the concept though. This is probably referring to Google’s Firefox extension, “Web Comments” by Glen Murphy. That firefox extension does look like it does a lot of what is described in the patent application. 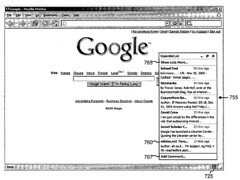 The official Google Blog post about the extension gives credit for its creation to Aaron Boodman, who is one of the named inventors on the patent application.